Stolen 1612 Map of Canada to be Auctioned? 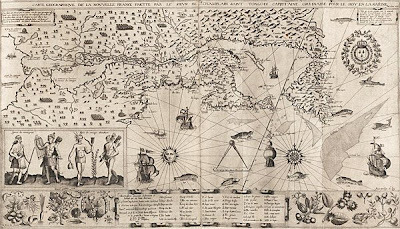 Thanks to The Map Room we learn that a rare copy of Samuel de Champlain’s 1612 map of Canada set to be auctioned at Sotheby’s next month, may be the same map discovered missing from Harvard University in 2005. The Harvard map was found missing in 2005 during an FBI investigation into a string of thefts from major libraries in the U.S. and Britain that saw about 100 cartographic treasures &#8211 worth an estimated $3 million US in total &#8211 sliced from centuries-old atlases and exploration journals. Massachusetts antiquarian E. Forbes Smiley, a well-known collector and dealer of rare maps, eventually admitted to the thefts and is serving three years in a U.S. prison for the crime. He helped authorities recover many of the stolen maps as part of a plea bargain, but the 1612 Champlain map removed from Harvard’s Houghton Library was not among those he admitted taking. The Champlain map is one of top-priced items at Sotheby’s Nov. 13 Natural History, Travel, Atlases and Maps sale. According to the Calgary Herald the map was the first to be published to show Montreal, Lake Champlain and the Great Lakes as a chain of connected waterways.